- city girl diaries -: Say "No" to Stress! This is a super delayed post. hehe. A therapy indeed! I never thought that I'll be feeling this great despite the stress from work. Well, stress doesn't actually pertain to the nature of my job, but more of my work environment. Let's just say that it really pisses me to be surrounded by people worth hatin'. My bestfriend and I have the same sentiments when it comes to work, or should i say, our office? haha! So we met up at Glorietta, uncertain of what to do. 1st stop: Burger King - I got the new Cool Angry Whopper Jr. meal. Haha well it matched my mood. Cool 'coz it's new, angry 'coz it's kinda hot & spicy. 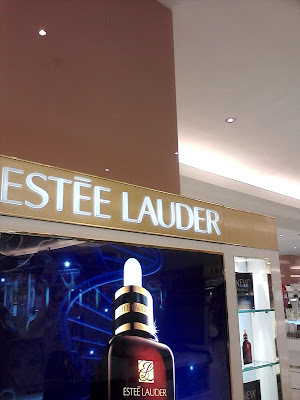 2nd stop: Estee Lauder in Rustans - We visited my Aunt at her stall inside Rustans. I think we brought her good luck 'coz she got a customer after we arrived. haha! Well, the best part was playing with their makeup testers! We even got unlimited spray of Estee Lauder perfume haha! Bag it all up with attitude!